Today, Microsoft quietly announced that both MapPoint, and its consumer facing subset Streets & Trips (the “#1 best-selling travel and map software for 13 years straight), would be coming to end of life as of the end of this year. Perhaps most surprising in these announcements is that either product still lingered on after all these years, as the idea of a standalone map product installation seems ancient now in the world of online mapping, location services, and our increasingly mobile world. MapPoint served not only to display maps, particularly within other applications such as Microsoft Office, but allowed businesses and developers to use the maps to overlay proprietary information on top of them, in a sort of a GIS hybrid. Streets and Trips offered locally installed versions of area street maps, along with at one time an ever increasing set of peripheral information, including campgrounds, state and national parks, gas stations, landmarks, casinos, amusement parks, and more. Microsoft is suggesting that current users switch to Bing Maps, and that MapPoint users can use PowerBI for Excel for data visualization, and the Bing Maps API and SDKs for custom development. But while most users stopped using either MapPoint or Streets & Trips long ago (and to be honest, most probably switched to the more feature complete Google Maps products, even though professional use of them is no longer free), users, both current and future, are going to have to scramble to make Bing Maps work for them. Ballmer’s initial plan was to acquire Nokia’s handset business as well as its mapping unit. In the end, though, Microsoft only acquired the mobile division, and only licensed the Here Maps from Nokia. The Microsoft Board reportedly rejected the first deal as too expensive and complex, including not only the handset division but also a mapping unit Microsoft didn’t need. 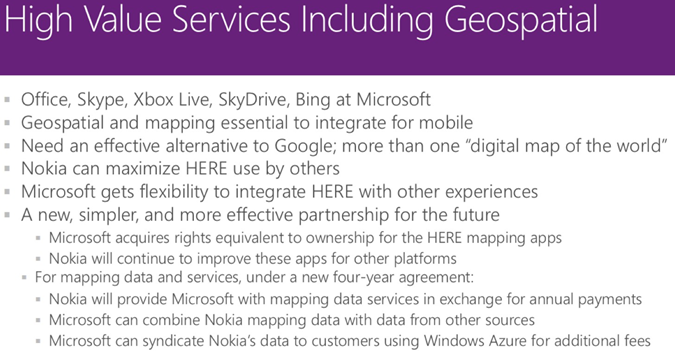 What still remains unclear, however, is how Microsoft plans to consolidate Bing Maps (which uses, among others, Nokia provided information but lays its own interface on top) with HERE Maps, which up until now have been a somewhat confusing element of Nokia branded Windows Phones (and which according to the slide above, Microsoft owns “rights equivalent to ownership”). Are Microsoft users supposed to use Bing Maps, or HERE Maps? For users of Streets & Trips (and admittedly, that’s not many users), the choice is fairly simple: in order to continue to have offline access to maps, they need to choose HERE instead of Bing Maps, in contrast to what Microsoft proposes. It’s pretty simple: Microsoft needs one mapping service brand, connected to all of its consumer facing devices and services, offering a full set of features all under one roof. Anything less than that is too confusing. If we take Microsoft’s decision to shut down MapPoint and Streets & Trips as an effort at consolidation, then that’s certainly a good first step in solving the branding. Stephen Elop promised as early as January of 2012, that “across all the Microsoft properties including Bing maps, more and more work will be done by Nokia”. Of course this was well before the acquisition by Microsoft of Nokia’s phones businesses, but the fact remains that here we are, close to three years later, and Microsoft’s map branding remains almost as murky as ever.